Dr. Nish Sonwalkar (ScD, MIT) was first to introduce the pedagogical effectiveness index. Article orignially published in the January 2002 issue of Syllabus Magazine. In articles appearing in our November and December issues, Nishikant Sonwalkar examined the elements of online learning within the structure of a learning cube. 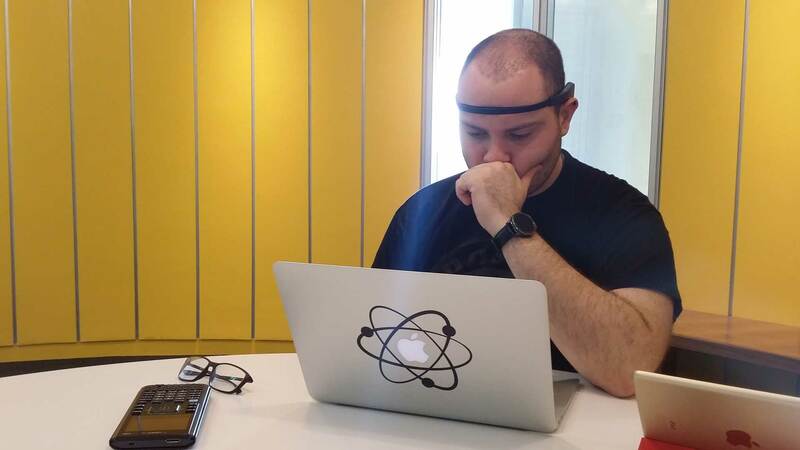 Here, he proposes an instrument for evaluating online courses based on those elements. Online course offerings are increasing in number every day. Most universities and corporate training facilities now offer some or all of their courses online. In fact, more than 1,000 corporate universities and online providers offer courses in everything from information technology to Chinese cooking. Although it is clearly advantageous for asynchronous learners to access educational information and content anywhere and anytime, it is difficult to evaluate the quality and effectiveness of online courses and learning modules. Open source learning platforms and public access to online course content are increasingly popular because higher education can benefit from joint development efforts and shared resources, which ultimately reduce the cost of online learning. Consortia are sharing volumes of information and courseware, and several vendors are providing their technology as open source materials. In the open source, open content environment we are entering, it is important to develop a common, objective scale and summative instrument with which to measure the pedagogical effectiveness of online course offerings. In my two previous articles in Syllabus (November and December 2001), I described the pedagogical learning cube (see Figure 1) in the context of instructional design. 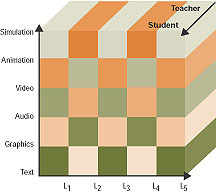 In this article, Ill again invoke the cube, including the five functional learning stylesapprenticeship, incidental, inductive, deductive, and discovery (x-axis); the six media elementstext, graphics, audio, video, animation, and simulation (y-axis); and the third axis of the cube (the z-axis), which represents the interactive aspects of learning. The z-axis indicates the degree to which students are engaged with the learning content, moving from a teacher-centric to a student-centered approach. This interactivity axis (z-direction) of the cube may be defined in terms of five elements: system feedback, adaptive remediation and revision, e-mail exchange, discussion groups, and bulletin boards. With this definition of the learning cube, a framework can be constructed to define pedagogy as a 3D space. Pedagogical effectiveness is at the heart of online offerings and defines critical parameters for the evaluation of courses. However, learning management systems provide the essential integrative layer for online courses. If online courses are delivered in the context of learning management systems, several additional factors must be considered in any evaluation. I propose a new instrument for overall evaluation, based on a five-factor summative rating system plus a pedagogy effectiveness index (PEI). The intent of the methodology described here is to create objective criteria for evaluating the quality of online courses based on the existing elements that represent pedagogical content. Expanding on the above arguments, the pedagogical effectiveness of an online course can be defined as a summation of learning styles, media elements, and interactivity. Assuming that each of those factors are equally likely and mutually exclusive, a probability distribution tree diagram (see Figure 2, page 19) can be shown to have three branches, with sub-branches represented for each axis of the pedagogical learning cube. A PEI can therefore be determined by a summative rule (see Figure 3, page 19). The corresponding probability multipliers can be shown in a simple matrix (see Figure 4). Consider the following cases as examples of the application of the PEI. These cases clearly illustrate that the PEI varies from 0 to 1. The probability of the pedagogical effectiveness increases as cognitive opportunity increases with the inclusion of learning styles, media elements, and interaction. The PEI is based on a simple probability distribution and should be considered an approximate indicator within the bounds of assumptions listed above, specifically relating to the flexible learning approach depicted by the pedagogical learning cube. The PEI serves as an indicator of the pedagogical richness of a course. However, online course delivery systems include several additional factors that affect the measure of success. Objective criteria for a summative evaluation should be applied in five major areas, including (1) content factors, (2) learning factors, (3) delivery support factors, (4) usability factors, and (5) technological factors. These factors are evaluated with reference to the learning technology standards proposed by IMS, AICC, and SCORM. Content factors. The content is the basis for course delivery and must be good to begin with. Mediocre content cannot be improved simply by infusing it with pedagogical styles or multimedia tools. It is important that an independent authority authenticates the accuracy and quality of the content. The source and author of the content must be given proper attribution to avoid copyright and compensation issues and to hold the author responsible for the contents quality. Learning factors. The effectiveness of an online course depends on the quality of pedagogically driven instructional design. The learning factors at the core of the educational quality of an online course include concept identification, pedagogical styles, media enhancements, interactivity with the educational content, testing and feedback, and collaboration. Often, the objectives of a course are not well-defined. It is important that the instructional design is sensitive to the functional learning style that accommodates individual content sequencing and aggregation preferences. Delivery support factors. The success of an online course depends heavily on the delivery support function essential for course instructors, administrators, and users. A software module should manage user authentication, portfolio information, and records of users activities throughout the course, as well as course content elementsincluding video streaming servers, audio servers, and the HTML server. Also, the federal government now requires colleges and universities to make access to online course content available to students with vision and hearing impairments. Usability factors. Even if the quality of the content, pedagogical styles, and multimedia tools is high, an online course can be a complete failure if usability is poor. Users interact with online Web courses through a graphical user interface, so the design of graphic elements, the color scheme, the type fonts, and navigational elements can all affect how a course is organized and perceived by students. Web pages that are loaded with information require excessive scrolling within a window and can be detrimental to the educational quality of the presentation. Design experts recommend presenting small chunks of information in 800×600-pixel windows. Page layout and ease of access from other parts of the course site are crucial to the success of an online course. Technological factors. The issues that influence the technological success of online courses include available bandwidth, target system configuration, server capacity, browser software, and database connectivity. The network bandwidth defines what is the lowest common denominator for the course Web page. Designing for 56 kilobits/sec modem access has more limitations than designing for a T1 network connection of 1 megabit/sec. The number of simultaneous users a Web server can handle is also an important constraint for the large-scale deployment of online courses. The advantage of using the overall rating formula lies in the ability to incorporate the scores of both the pedagogical and delivery systems to provide a final rating that will be useful for comparing online course offerings. The pedagogy effectiveness index and the summative evaluation instrument used in combination can be powerful tools for evaluating large numbers of online offerings. These criteria have a clear emphasis on pedagogically driven design. Widespread use of these tools could guide and motivate online education developers, universities, and training centers toward the creation of educational systems marked by measurable success. Download the PDF of the original article.